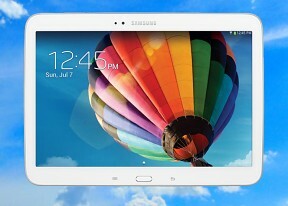 The Samsung P5200 Galaxy Tab 3 10.1 has basic connectivity features, including quad-band 2G and 3G support. There are WiFi only (P5210) and LTE-enabled (P5220) variants as well, so you'll have to check to see which model number you have. The USB port also acts as a USB Host, which means that besides charging and connectivity, you'll be able to connect various USB accessories to your Tab 3 10.1. The AllShare DLNA functionality, which used to be a standalone application, is now more tightly integrated into the respective Samsung applications. To share or access content on nearby DLNA-enabled devices, you do this directly from the Video Player app, the Gallery, and the Music Player. A cooler way to share is with Group Play, recently introduced with the Galaxy S4 flagship. It shares various multimedia across multiple devices in the same room, but unlike DLNA, it's interactive. You can share images, documents, music, and even play games. While this version of Group Play does not require NFC for connectivity - devices communicate over Wi-Fi, with your Galaxy Tab 3 10.1 as the hotspot that others connect to - the other devices will still need to support Group Play. The Peel Smart Remote is the primary app used with the built-in IR emitter on the top of the phone. The app starts out by asking your zip code and pulls up a number of TV service providers in that area, so it can double as a TV Guide. The Samsung Galaxy Tab 3 10.1s large screen means that web browsing is a great experience on the device. The pixel density of the screen isn't very high, but that only matters if you like reading text at low zoom levels (it gets fuzzy). The browser supports both double tap and pinch zooming. There are niceties such as multiple tabs, incognito tabs, text reflow, find on page and so on. You won't have to worry about mobile versions of sites either, as the display is large enough to accommodate desktop versions of most sites. The Chrome browser also comes preloaded on the Tab 3 10.1, and gives you access to many additional features, including Labs support for experimental options from Google. Flash cannot be enabled in either browser, as support for plug-ins has been dropped by Adobe.